Beginning each performance with their trademark greeting, "Mighty fine and a great big Western 'Howdy,' all you buckaroos and buckarettes," Riders in the Sky simultaneously paid tribute to and poked gentle fun at the classic cowboy songs of the 1930s and 1940s, particularly the work of the Sons of the Pioneers, Roy Rogers, and Gene Autry. During the 1980s and 1990s, the group was notable for its ability to attract fans both firmly within the country tradition (the Riders are members of the Grand Ole Opry) and from outside. Riders in the Sky are made up of lead singer Ranger Doug (born Douglas B. Green), Woody Paul (born Paul Chrisman) on fiddle and vocals, Too Slim (string bass and guitar), and since the mid-'90s, "Cowpolka King" Joey Miskulin on accordion. Before forming the band, the Michigan-born Ranger Doug was a member of Bill Monroe's Bluegrass Boys and was also a country music journalist, working at the Country Music Foundation Press as editor of the Journal of Country Music. Prior to joining the Riders, Woody Paul, a formidable swing fiddler, played with Loggins & Messina, and Too Slim was a member of Dickey Lee's band in addition to being a songwriter. The trio formed in the mid-'70s, playing a weekly gig at a Nashville nightclub that led to a slot on Tumbleweed Theater on cable television's Nashville Network (TNN). Riders in the Sky made their recording debut in 1979 on the Rounder label with Three on the Trail, which set the pattern for their mix of classic and newly composed sentimental western numbers, parodies (like "The Legend of Palindrome," in which a figure resembling television's Paladin is described exclusively in sentences that read the same backwards and forwards), crack swing instrumental work, and Sons of the Pioneers-style harmony singing. They released five albums on MCA in the 1980s, and in 1985 they appeared in Sweet Dreams, the film biography of Patsy Cline. The group returned briefly to MCA in 1987, releasing Riders Radio Theater a year later. The success of that album led to the program Riders Radio Theater on National Public Radio, where the group was already well known from performances on Garrison Keillor's Prairie Home Companion program. In 1991 the Riders moved to CBS for the children's album Harmony Ranch, which led to a short-lived CBS-TV Saturday-morning television show. 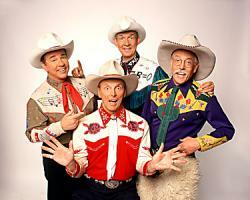 Riders in the Sky continued recording for Rounder and other labels into the 2000s, offering a Great Big Western Howdy! in 1998 and Christmas the Cowboy Way a year later. In 2000, Woody's Roundup: A Rootin' Tootin' Collection of Woody's Favorite Songs was released, and 2002's A Pair of Kings showcased the increasingly impressive instrumental talents of Miskulin and Paul. As Riders in the Sky approached their 25th anniversary they were known as an unfailing concert draw: Their shows featured such novelties as rope tricks in addition to music and humor.